The uninitiated might take the existence of braille for granted but Sébastien Lancrenon and Jean-Baptiste Saudray’s The Braille Legacy dramatises the fascinating and moving true story behind its invention. Translated by Ranjit Bolt, the musical slots neatly into Thom Southerland’s takeover of the Charing Cross Theatre and supported as it is by the Royal National Institute of Blind People, it makes for an interesting piece. The Menier’s festive musical is always to look forward to and this year’s is no exception – a revival of the classic She Loves Me, based on Miklós László’s play Parfumerie which has been remade more than once as films The Shop Around The Corner, In The Good Old Summertime, and You’ve Got Mail. Recently seen on Broadway in a superlative rendition that was the first ever show to be live-streamed there, Joe Masterhoff’s book pits warring Budapest shop employees Georg Nowack and Amalia Balash against each other, little knowing that they are corresponding anonymously through a lonely hearts column – will they get together in the end? What do you think? The Union is dead, long live the Union. Southwark’s Union Theatre has now moved into its new premises just across the way and for their debut production there, have returned to their 2012 production of John Dempsey and Dana P Rowe’s The Fix. Michael Strassen returns to direct a new cast but I have to admit that I think this is just a show that I am not destined to ever get on with. 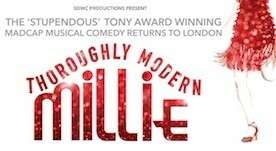 Based on a film from 1967, the musical of comedy pastiche Thoroughly Modern Millie actually only dates back to 2000, though a substantial deal of its humour harks back to an uncomfortably old-school era. Set in 1920s New York, Millie Dillmount arrives determined to marry for money instead of love but finds herself mixed up in a white slavery ring run by a faded actress pretending to be a Chinese woman (as you do). The Landor has a sterling record in successfully mounting small-scale productions of big musicals but Matthew Iliffe’s production doesn’t always hit the mark.